"This soup is so yummy on a cold day." Coat a large pot with cooking spray and place over medium-high heat. Cook and stir chicken, bell peppers and onion until chicken is brown and peppers are just tender. Stir in corn, beans, tomatoes, tomato sauce and water. Season with chili powder, parsley, garlic powder, cayenne and cumin. Reduce heat, cover and simmer 30 minutes. This is a good recipe. For a quick meal I used ground chicken and chicken broth instead of water. It is now on our list of regular meals, and it carries well for lunch the next day. I scaled the recipe in half, and my husband and I still made 2 meals of it. I didn't modify anything else, and it was very delicious. 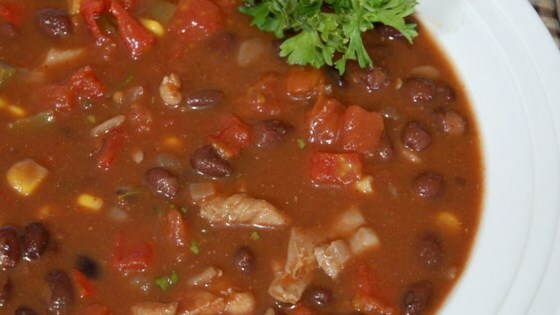 Flavorful chili with low fat! Tasted great and wasn't too spicy. I'll make it again. Made with a side of cornbread for a hearty meal on a cold day.